This is “Conflict Management”, section 10.3 from the book An Introduction to Organizational Behavior (v. 1.0). For details on it (including licensing), click here. Understand different ways to manage conflict. Understand your own communication style. Learn to stimulate conflict if needed. There are a number of different ways of managing organizational conflict, which are highlighted in this section. Conflict managementResolving disagreements effectively. refers to resolving disagreements effectively. “But when you don’t order the parts we need for a new product, you delay the whole project,” Vanessa says. Sharon, the business unit’s vice president, hits upon a structural solution by stating, “From now on, both of you will be evaluated on the total cost and the overall performance of the product. You need to work together to keep component costs low while minimizing quality issues later on.” If the conflict is at an intergroup level, such as between two departments, a structural solution could be to have those two departments report to the same executive, who could align their previously incompatible goals. If the conflict is between team members, the easiest solution may be to change the composition of the team, separating the personalities that were at odds. In instances in which conflict is attributed to the widely different styles, values, and preferences of a small number of members, replacing some of these members may resolve the problem. If that’s not possible because everyone’s skills are needed on the team and substitutes aren’t available, consider a physical layout solution. Research has shown that when known antagonists are seated directly across from each other, the amount of conflict increases. However, when they are seated side by side, the conflict tends to decrease.Gordon, J., Mondy, R. W., Sharplin, A., & Premeaux, S. R. (1990). Management and organizational behavior. New York: Simon & Schuster, p. 540. 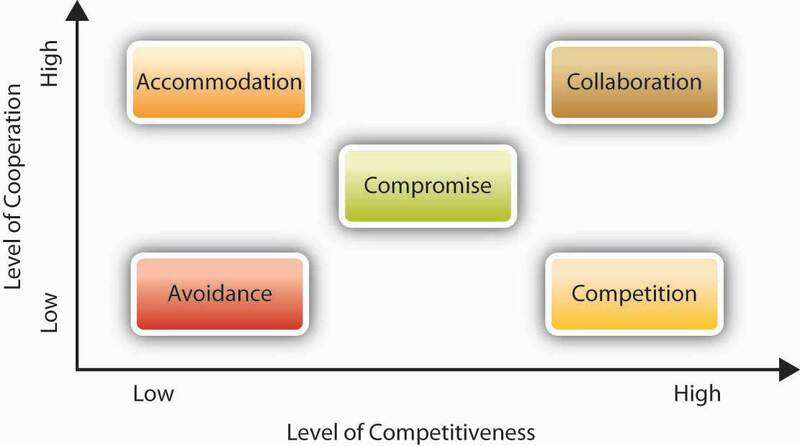 Group conflict within an organization can be mitigated by focusing attention on a common enemy such as the competition. For example, two software groups may be vying against each other for marketing dollars, each wanting to maximize advertising money devoted to their product. But, by focusing attention on a competitor company, the groups may decide to work together to enhance the marketing effectiveness for the company as a whole. The “enemy” need not be another company—it could be a concept, such as a recession, that unites previously warring departments to save jobs during a downturn. Sometimes a group conflict can be resolved through majority rule. That is, group members take a vote, and the idea with the most votes is the one that gets implemented. The majority rule approach can work if the participants feel that the procedure is fair. It is important to keep in mind that this strategy will become ineffective if used repeatedly with the same members typically winning. Moreover, the approach should be used sparingly. It should follow a healthy discussion of the issues and points of contention, not be a substitute for that discussion. Problem solving is a common approach to resolving conflict. In problem-solving mode, the individuals or groups in conflict are asked to focus on the problem, not on each other, and to uncover the root cause of the problem. This approach recognizes the rarity of one side being completely right and the other being completely wrong. Individuals vary in the way that they handle conflicts. There are five common styles of handling conflicts. These styles can be mapped onto a grid that shows the varying degree of cooperation and assertiveness each style entails. Let us look at each in turn. The avoidingAn uncooperative and unassertive conflict-handling style. style is uncooperative and unassertive. People exhibiting this style seek to avoid conflict altogether by denying that it is there. They are prone to postponing any decisions in which a conflict may arise. People using this style may say things such as, “I don’t really care if we work this out,” or “I don’t think there’s any problem. I feel fine about how things are.” Conflict avoidance may be habitual to some people because of personality traits such as the need for affiliation. While conflict avoidance may not be a significant problem if the issue at hand is trivial, it becomes a problem when individuals avoid confronting important issues because of a dislike for conflict or a perceived inability to handle the other party’s reactions. The accommodatingA cooperative and unassertive conflict-handling style. style is cooperative and unassertive. In this style, the person gives in to what the other side wants, even if it means giving up one’s personal goals. People who use this style may fear speaking up for themselves or they may place a higher value on the relationship, believing that disagreeing with an idea might be hurtful to the other person. They will say things such as, “Let’s do it your way” or “If it’s important to you, I can go along with it.” Accommodation may be an effective strategy if the issue at hand is more important to others compared to oneself. However, if a person perpetually uses this style, that individual may start to see that personal interests and well-being are neglected. The compromisingA middle-ground conflict-handling style, in which a person has some desire to express their own concerns and get their way but still respects the other person’s goals as well. style is a middle-ground style, in which individuals have some desire to express their own concerns and get their way but still respect the other person’s goals. The compromiser may say things such as, “Perhaps I ought to reconsider my initial position” or “Maybe we can both agree to give in a little.” In a compromise, each person sacrifices something valuable to them. For example, in 2005 the luxurious Lanesborough Hotel in London advertised incorrect nightly rates for £35, as opposed to £350. When the hotel received a large number of online bookings at this rate, the initial reaction was to insist that customers cancel their reservations and book at the correct rate. The situation was about to lead to a public relations crisis. As a result, they agreed to book the rooms at the advertised price for a maximum of three nights, thereby limiting the damage to the hotel’s bottom line as well as its reputation.Horowitz, A., Jacobson, D., Lasswell, M., & Thomas, O. (2006, January–February). 101 dumbest moments in business. Business 2.0, 7(1), 98–136. Body language can fuel a conflict. People exhibiting a competingA conflict-handling style that is highly assertive but low on cooperation. style want to reach their goal or get their solution adopted regardless of what others say or how they feel. They are more interested in getting the outcome they want as opposed to keeping the other party happy, and they push for the deal they are interested in making. Competition may lead to poor relationships with others if one is always seeking to maximize their own outcomes at the expense of others’ well-being. This approach may be effective if one has strong moral objections to the alternatives or if the alternatives one is opposing are unethical or harmful. The collaboratingA conflict-handling style that is high on both assertiveness and cooperation. style is high on both assertiveness and cooperation. This is a strategy to use for achieving the best outcome from conflict—both sides argue for their position, supporting it with facts and rationale while listening attentively to the other side. The objective is to find a win–win solution to the problem in which both parties get what they want. They’ll challenge points but not each other. They’ll emphasize problem solving and integration of each other’s goals. For example, an employee who wants to complete an MBA program may have a conflict with management when he wants to reduce his work hours. Instead of taking opposing positions in which the employee defends his need to pursue his career goals while the manager emphasizes the company’s need for the employee, both parties may review alternatives to find an integrative solution. In the end, the employee may decide to pursue the degree while taking online classes, and the company may realize that paying for the employee’s tuition is a worthwhile investment. This may be a win–win solution to the problem in which no one gives up what is personally important, and every party gains something from the exchange. Like much of organizational behavior, there is no one “right way” to deal with conflict. Much of the time it will depend on the situation. However, the collaborative style has the potential to be highly effective in many different situations. We do know that most individuals have a dominant style that they tend to use most frequently. Think of your friend who is always looking for a fight or your coworker who always backs down from a disagreement. Successful individuals are able to match their style to the situation. There are times when avoiding a conflict can be a great choice. For example, if a driver cuts you off in traffic, ignoring it and going on with your day is a good alternative to “road rage.” However, if a colleague keeps claiming ownership of your ideas, it may be time for a confrontation. Allowing such intellectual plagiarism to continue could easily be more destructive to your career than confronting the individual. Research also shows that when it comes to dealing with conflict, managers prefer forcing, while their subordinates are more likely to engage in avoiding, accommodating, or compromising.Howat, G., & London, M. (1980). Attributions of conflict management strategies in supervisor-subordinate dyads. Journal of Applied Psychology, 65, 172–175. It is also likely that individuals will respond similarly to the person engaging in conflict. For example, if one person is forcing, others are likely to respond with a forcing tactic as well. What If You Don’t Have Enough Conflict Over Ideas? Part of effective conflict management is knowing when proper stimulation is necessary. Many people think that conflict is inherently bad—that it undermines goals or shows that a group or meeting is not running smoothly. In fact, if there is no conflict, it may mean that people are silencing themselves and withholding their opinions. The reality is that within meaningful group discussions there are usually varying opinions about the best course of action. If people are suppressing their opinions, the final result may not be the best solution. During healthy debates, people point out difficulties or weaknesses in a proposed alternative and can work together to solve them. The key to keeping the disagreement healthy is to keep the discussion focused on the task, not the personalities. For example, a comment such as “Jack’s ideas have never worked before. I doubt his current idea will be any better” is not constructive. Instead, a comment such as “This production step uses a degreaser that’s considered a hazardous material. Can we think of an alternative degreaser that’s nontoxic?” is more productive. It challenges the group to improve upon the existing idea. Traditionally, Hewlett-Packard Development Company LP was known as a “nice” organization. Throughout its history, HP viewed itself as a scientific organization, and their culture valued teamwork and respect. But over time, HP learned that you can be “nice to death.” In fact, in the 1990s, HP found it difficult to partner with other organizations because of their culture differences. During role plays created to help HP managers be more dynamic, the trainers had to modify several role-plays, because participants simply said, “That would never happen at HP,” over the smallest conflict. All this probably played a role in the discomfort many felt with Carly Fiorina’s style as CEO and the merge she orchestrated with Compaq Computer Corporation, which ultimately caused the board of directors to fire Fiorina. On the other hand, no one is calling HP “too nice” anymore. OB Toolbox: How Can You Stimulate Conflict? Encourage people to raise issues and disagree with you or the status quo without fear of reprisal. An issue festering beneath the surface, when brought out into the open, may turn out to be a minor issue that can be easily addressed and resolved. Create a competition among teams, offering a bonus to the team that comes up with the best solution to a problem. For example, have two product development teams compete on designing a new product. Or, reward the team that has the fewest customer complaints or achieves the highest customer satisfaction rating. Build some ambiguity into the process. When individuals are free to come up with their own ideas about how to complete a task, the outcome may be surprising, and it allows for more healthy disagreements along the way. Conflict management techniques include changing organizational structures to avoid built-in conflict, changing team members, creating a common “enemy,” using majority rules, and problem solving. Conflict management styles include accommodating others, avoiding the conflict, collaborating, competing, and compromising. People tend to have a dominant style. At times it makes sense to build in some conflict over ideas if none exists. List three ways to decrease a conflict situation. What are some pros and cons of each of these approaches? Do you deal with conflict differently with friends and family than you do at work? If so, why do you think that is? What is your usual conflict-handling style at work? Do you see it as effective or ineffective? Describe a situation in which not having enough conflict can be a problem.